Be the first to share your favorite memory, photo or story of Sr. Anne . This memorial page is dedicated for family, friends and future generations to celebrate the life of their loved one. 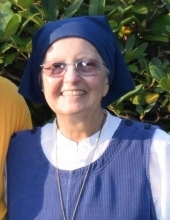 Sr. Anne Marie Shuster, 75, of Fairview Twp., New Cumberland, died Tuesday, April 02, 2019, at her home. She retired as an administrator for the Commonwealth of PA, Dept. of Education, Bureau of Certification, Harrisburg. On April 4, 2016, she professed to become a Hermit Sister in a ceremony presided over by Most Reverend Bishop Gainer and Very Reverend Burger. Born on January 7, 1944, in Sellersville, she was the daughter of the late Francis H. and Anne M. (Jarose) Waldspurger. She is survived by a daughter, Amy Crosswait and her spouse Guy Crosswait of Humble, TX, and a grandson, Evan Crosswait. A Traditional Latin Mass of Catholic Burial, will be celebrated at 10:30 am on Monday at Mater Dei FSSP Community at St. Lawrence Chapel, 110 State Street, Harrisburg, with Fr. Gregory Eichman and Fr. David Franco con-celebrating the Mass. Burial will be at 2:45 PM Monday in St. Stanislaus Catholic Church Cemetery, 51 Lansdale Ave., Lansdale, PA.
A viewing will be held one hour prior to the Mass in the church. In lieu of flowers, due to being in the midst of the Lenten Season, memorial contributions are respectfully requested to The Priestly Fraternity of Saint Peter, North American Headquarters, 450 Venard Road, South Abington Township, PA 18411. "Email Address" would like to share the life celebration of Sr. Anne Marie Shuster. Click on the "link" to go to share a favorite memory or leave a condolence message for the family.